Introduction: The genre of this movie is related to romantic comedy drama. This movie has a fairly similar massage as it was in the movie Oh My God by Umesh Shukla. The shooting took place in Dubai, London and in India. The Shooting of this movie was started on 16th of October 2013 on EID. Plot: The story starts with the life of struggling actor Inder Bhalla played by Abhisek Bachchan. He played the role of a musician. Rishi Kapoor played the role of Mr Bhalla, father of Inder Bhalla. Both of them were interrupted by their unwelcome mother, played by Smriti Irani. Asin, has played a very important role in this movie as Nimmi who helped Inder Bhalla a lot in his career and later on fall in love with him. Critic’s Review: This movie released on 21st August 2015 and in most parts of India this movie got an average response. Some says that there is less comedy and the movie could have been much better. Though, on the opening day the movie has bagged nearly Rs 2.9 crore. Cast and Direction: Umesh Shukla, the director of this movie has chosen the casts appropriately. 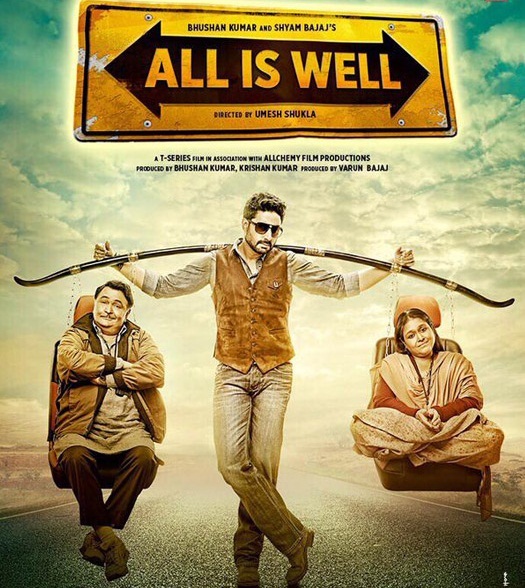 Abhishek Bachchan, Asin and Rishi Kapoor did justice to their characters. Smriti Irani and Supriya Pathak too got praised for their performances. Music given by Himesh Reshamiya and the songs “ Chaar Sahnivar” and Nachan Farrate has become super hit. Why will you watch: This movie has a social message which can be a reason to watch this movie. Besides, nice story you can also enjoy the songs and beautiful cinematography. So, one should not miss to watch this movie at least for once.